Hello sweet friends! This week is one that many DTA readers look forward to. The annual costume reveal. Two weeks ago I announced that this year’s creation would be an 18th Century Provençal Gal. One thing that I have learned in covering historical fashion is that there is a big interest in what lies underneath it all. 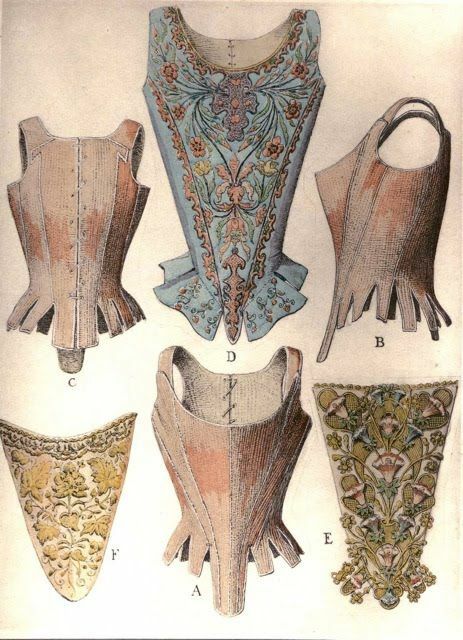 So today’s post will cover 18th Century Provencal Undergarments. For a complete understanding of the fashion of the era, we must begin with a bit of history. Just like today different levels of income resulted in different levels of fashion. This particular costume that I am creating would have been categorized for a merchants wife or female working class. Because of this, she would not have worn the same undergarments as worn by the nobility. Beyond wealth, it was a practicality issue. Can you imagine trying to work while wearing this? Even though the look below is more restrained it still has features which probably wouldn’t have been worn by someone working in the lavender fields. So let’s get to it! 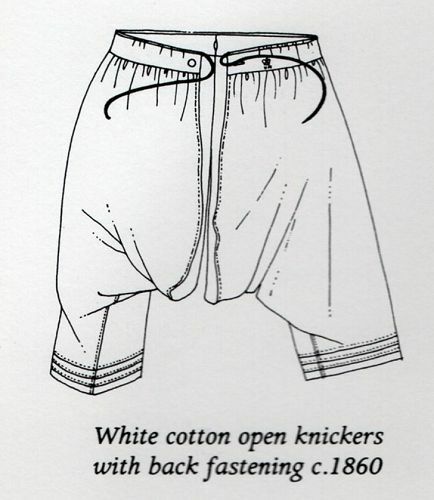 Open drawers, later known as bloomers, weren’t really introduced for women until around the 1830’s. So what did they wear as underpants? Nothing. Tis true. The chemise would be the first layer to put on. Bathing and washing clothing was not practiced as it is today so it was important to have a layer that would be changed regularly to protect outer clothing from body oils and perspiration. The chemise was often made from linen which is beautifully absorbent and allows the fabric to dry quite quickly. 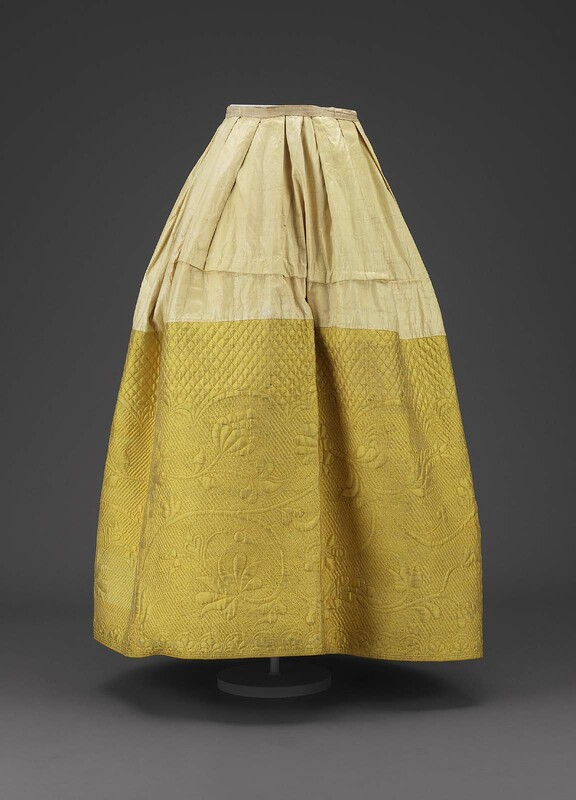 Chemises could also be made from wool, silk, or cotton but truly linen was the first choice. For my very first costume, I wrote a detailed post on shoes and stockings and shared a photo. I will wear the same cotton stockings since they would have been worn by a woman of the working class. You can see numerous other stocking styles HERE. A woman’s bust support came in the form of stays. There were a variety of stay styles and this is where class definitely becomes evident. 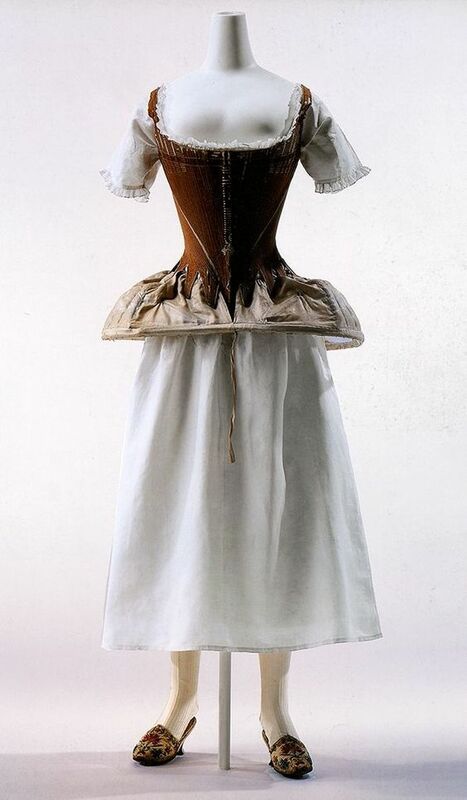 The upper classes would wear stays that laced up the back since they had servants to dress them. Now some of the wealthier merchants would also have worn back lacing stays if they could afford household staff. But the majority of the working or lower class women would have worn stays that laced up the front since they dressed alone. The term petticoat at this time was used to label what we now separately call a slip and a skirt. At the time the word skirt was used to describe the lower parts of a man’s waistcoat. In this post, the focus is on petticoats worn underneath outer clothing. We’ll cover exterior petticoats later this week. 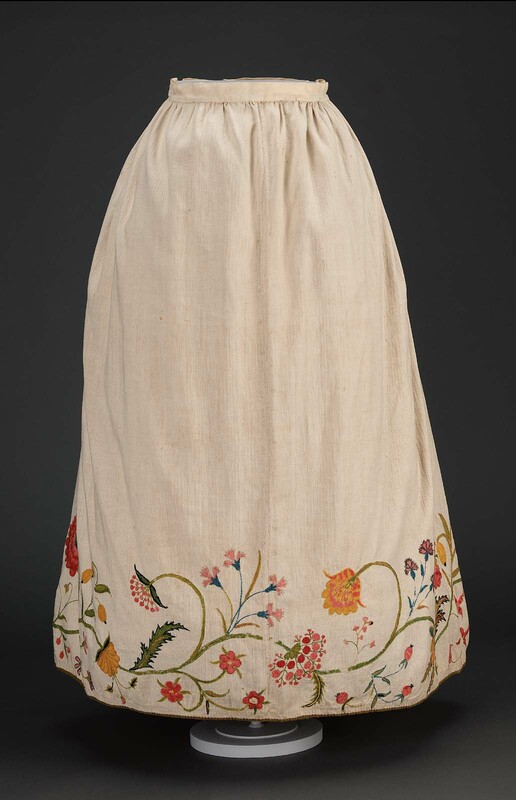 The under or interior petticoat was often made from a lightweight linen or cotton for summer. It was not usual that the under petticoat would feature lovely embroidery even though it was not seen publicly. 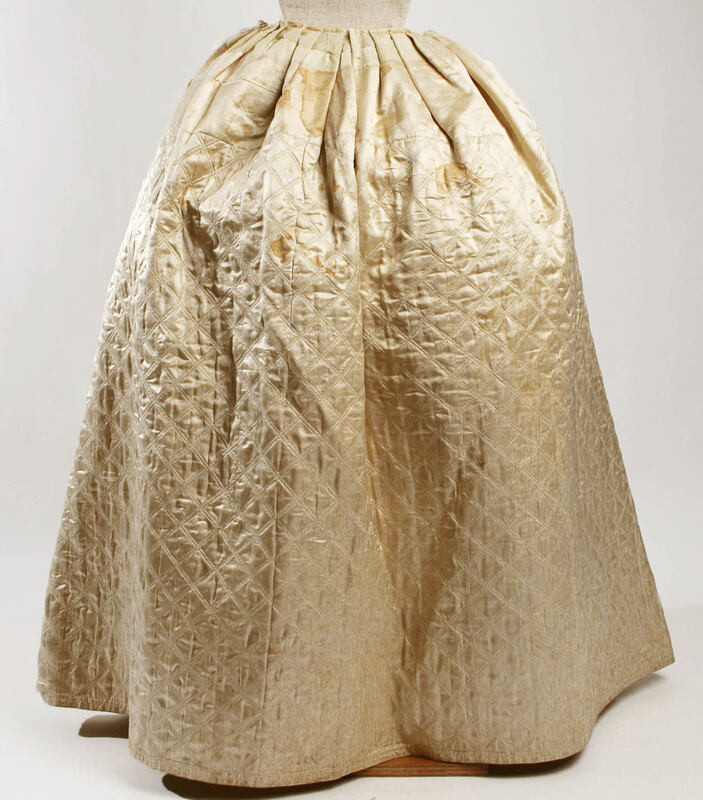 Quilted under petticoats could be worn for warmth in the winter. They were made primarily from silk or wool. But again, the fabric used would have been determined by the wealth of the wearer. Those of the lower classes would not have been able to afford silk. A good clue when researching historical petticoats and trying to determine if they were worn underneath is that interior petticoats often had a smooth upper layer made from a different fabric. This construction design eliminated bulk at the waist for a smoother overall look. 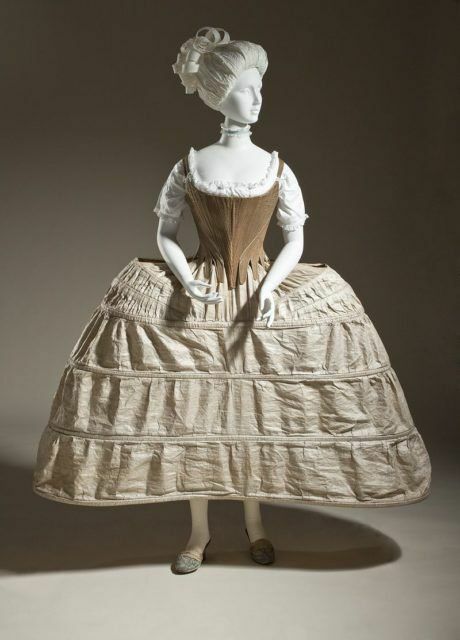 But keep in mind that exterior petticoats were often repurposed as interior petticoats when they began to show wear. 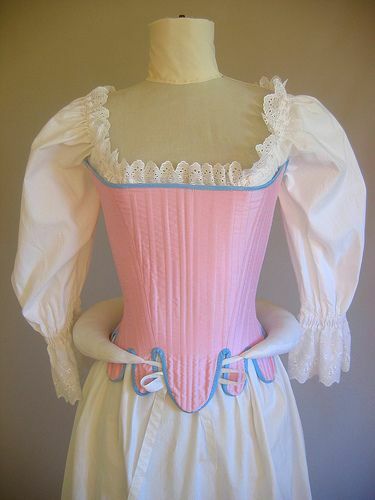 It should also be noted that under petticoats came in all colors. If a bum roll was worn it would be the last thing to be added before the exterior clothing was added. Its main purpose was to act as a support under the exterior petticoat to create the desired silhouette of the time. They came in a wide variety of styles. A good article on the different styles can be found HERE. I made my undergarments using Simplicity Pattern 8162. I purchased it at JoAnn’s at a $1.99 sale. The chemise is made from a lovely white linen I found in the Dallas fabric district for an incredible $3.00 a yard. The total cost for the fabric was $9 since 3 yards was required. The thread used was 100% cotton. It was purchased at Hobby Lobby using a coupon and was a little over one dollar. Total cost of chemise: $12.00. I love the ruffle detail on the sleeve. The ruffled neckline is adjustable via a drawstring. Tomorrow I will be sharing a seasonal decorating post and will be back Wednesday with another fashion post. Oh my goodness. You always go into such detail to create authentic costumes. The undergarments are amazing. While they look amazing.. so much time and effort gone into creating undergarments.. I am also thankful for being born into this century.. don;t know if I could have handled all that! So amazing. I am happy I didn’t have to do all this before arriving at my school by 6:00 a.m. all the many years I worked. I do love the embroidery on the slip, I would have had a hard time not showing that off. Great post, Laura – with such detail. Thank you for sharing this with us! I am glad we don’t have so many layers these days. This is fascinating Laura, and your chemise turned out nicely. I still have undergarments from that same estate from which I purged the nightgowns…. the open britches have garters attached . The stay is laced in the back with flat closures in front, boning all around. A stay is as close to a tutu as one can experience. We always used to say “breathing is secondary”. I love this post, Laura. I would love it no matter the nationality, but it is of great interest to me to know what my ancestors wore. I knew about the open bloomers, but I was amazed when I read a while back that some of the upper-class women held a specially shaped bowl between their legs at dances to, ahem….relieve themselves. It is fascinating to learn what used to be acceptable behavior. No undergarments until the 1830s?!? That’s very interesting. The embroidery on the slip is so beautiful! I would have problems covering it up. Love your sense of style in the costume department and I’m so excited to see it on you! I do take historical costuming seriously and am anxious to see your next post. So happy we in this day and age have better options, but have always felt that even a modern day bra was an invention meant for punishment. Clothing nowadays is certainly much simpler, isn’t it? Your linen chemise is lovely, Laura. I look forward to seeing the rest of your provencal costume.